This is a fact that Sydney wedding photographers are among the very best in the world. Research indicates that two of the best known Sydney image takers are also within the the top 5 international wedding photographers list and this is certainly a great source of inspiration for me, as a professional photographer, and for all Australian photographers! I get a thrill every time I do a wedding shoot and feel privileged to be a part of a couple’s special day, and working passionately to deliver the very best result for my clients. Every image tells a thousand words, take this Sydney wedding image for example, this image is so fresh and so natural and the bride is very happy and full of anticipation, yet relaxed knowing that her photographer is taking care of the whole day of photo-shoot. She is constantly being reassured by the very same photographer who covered her best friend’s wedding. 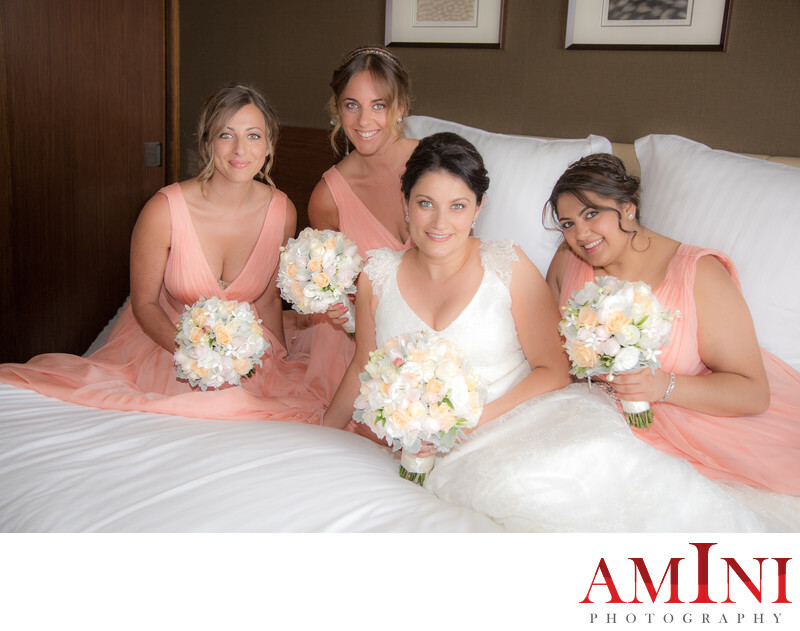 Location of this photo was Pullman Hotel at Sydney Olympic park, and during the bridal preparation of Stephanie and John’s wedding. The bride was an absolute pleasure to work with, and bridesmaids were equally delightful. This bride was referred to me by one of my past wedding clients which happened to be Stephanie’s best friend and the couple booked one of my whole day coverage packages with an art album. What I like about this image is pure joy of the bride shining through the lens, and her relaxed mood captured in the image. This was a Greek wedding, with the typical high dynamics and I have to say I love shooting Greek weddings, and any other cultural weddings, likes of Persian weddings, Indian weddings, and Chinese weddings among others. Bride and groom’s special day was a great success and I was with them every step of the way till conclusion of their wedding reception, unobtrusively capturing key images which I later edited in my adobe Light Room on my iMac. I took this image using my canon 5d mark iii with a canon L-Lens, 24-105 F4. Please rich out to me if you are looking for an experienced Sydney wedding photographer.